The purpose of the integrated test carried out in May at ASIPP was to verify whether all of the components of the poloidal field AC/DC converter unit, as well as installation and assembly procedures, met the system requirements. 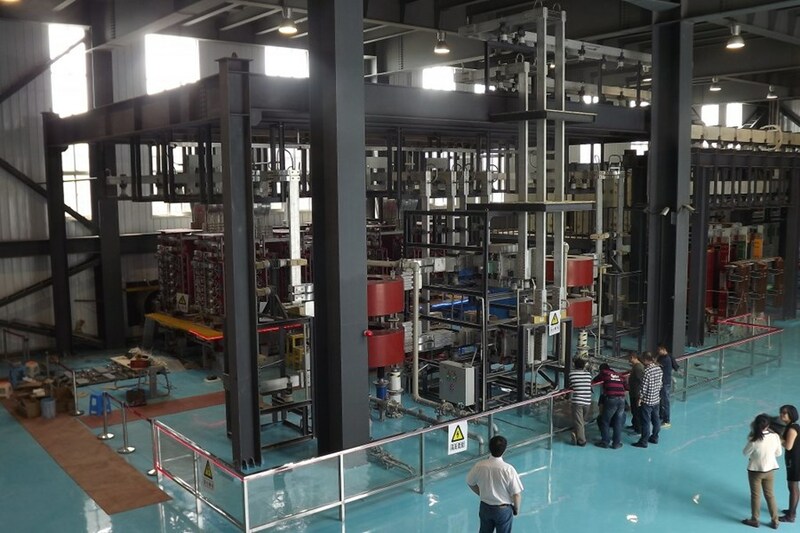 The procurement of ITER's poloidal field converters took a step forward in May, with the successful testing of the AC/DC converter unit prototype at the Institute of Plasma Physics, Chinese Academy of Sciences (ASIPP). China is responsible for procuring all 14 poloidal field converters that will provide controllable current/voltage to ITER's six poloidal field coils. The integrated test was completed on 9 May with technical staff from the ASIPP, the ITER Organization, the Chinese Domestic Agency and manufacturers present. As expected, the poloidal field AC/DC converter unit (PFCU) prototype demonstrated good performance throughout the entire stringent test. The PFCU prototype is composed of an AC disconnector, rectifier transformers, a converter module, an external bypass, DC disconnectors, DC reactors, and a local controller with a rated capacity of 80MVA and a rated current of 55 kA. By the end of last year, ASIPP had completed all the component tests, including 31 routine items as well as special tests. The purpose of the integrated test carried out in May was to verify whether all of the components, as well as installation and assembly procedures, met the system requirements. It also put the unit to the test under different operating modes, with an input voltage of AC 66 kV and variable output current and voltage according to the requirements of ITER operation. The test combination included the circulating current test, the parallel operation test, the rated current test, the voltage response test, and the 4-quadrant operation test. The success of the integrated tests will now provide data for the final design review as well as experience for future batch production.